This entry was posted in Environment, Farming, Nature and tagged farmland, pesticides, pollution, Pond Conservation, slugs, water. Bookmark the permalink. How disturbing. They need to populate their gardens and farms with frogs. Frogs will eat the slugs and they are much cuter. High levels of slug poison in rivers is obviously undesirable for everyone. Imagine being a farmer desperately trying to save a crop and finding that the expensive chemical has washed away! One of the problems with using natural predators is that if you put them in the field too early they starve to death before the slugs arrive. If you manage to introduce them at the right time, but the weather changes, Sod’s Law means that the predators die while the slugs are unaffected, and of course giving the slugs a head start is never a good idea. 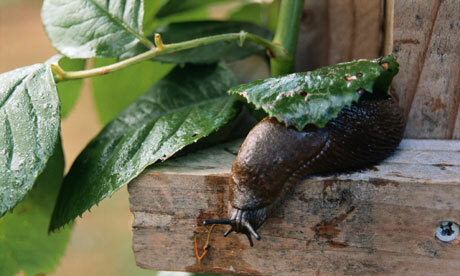 Leaving slug (or any other pest) control to completely natural populations of predators is subject to all the above problems, although it can be spectacularly successful in about 1 year in 10. But are you prepared to wait 10 years for some slug free potatoes, or margarine that is cheaper then butter? What we need is more research on non chemical controls, (or even better chemicals), but over the last 40 years the UK Government has closed at least 8 agricultural research institutes, several university departments, most of the Experimental Husbandry farms, and cut the size of the remaining research institutes by about 2/3. Research done in other countries suits conditions on foreign farms. All this leaves British Farmers at the mercy of the international chemical companies with the sad consequences for British rivers. Pesticides and Herbicides are the bane of our society. Ever since I started work as Garden Steward at Offley Place in Hertfordshire in 1965, I refused to use any chemicals, and have never used them since. The world seems to be catching up at last! Buffer strips and headlands, grassy margins or better still flower rich margins around the farmer’s fields would help in the long run. Yes, I’d like to see less usage of chemical inputs but they will take time, I guess. These options are all available under the Environmental Stewardship schemes and the Campaign for the Farmed Environment options also cover these. More effort is needed to alleviate problems such as those mentioned because with a changing climate, things will only get worse.